Ahead of their Champions League match against Man City , Real Madrid produced a performance which was enough to comfortably see off Athletic Bilbao with a convincing 5-1 victory. Mourinho made a couple of changes to his starting eleven with Modric and Benzema recalled, most probably to allow him to rotate slightly providing some players with a short degree of rest. For Athletic, Bielsa had no such luxury and was forced into a number of changes. Amorebieta returned from international duty injured whilst Herrara sat out due to suspension after being sent off for the second time this season. De Marcos also missed out. Athletic have lost their last seven games against Los Blancos conceding 25 goals in the process. There were no initial inferiority signs as the Basques began brightly, passing the ball with pace. However, that illusion was short lived. Athletic came into this game on the back of two consecutive league wins but even allowing for that, expectations were low. How things change from a season ago when Athletic arrived at the Santiago Bernabeu and took an early lead when playing some stylish, attacking football before they eventually succumbed to a heavy 4-1 defeat. On Saturday evening, there was no belief that this current Athletic side could produce anything close to that level. A couple of elements of the Athletic game are worth closer scrutiny. 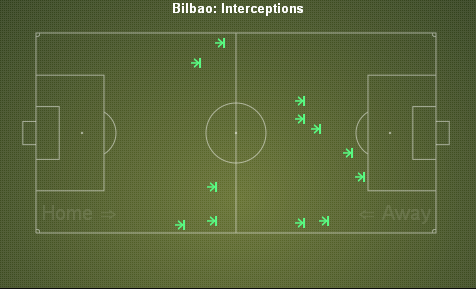 Under Bielsa, Athletic are known to play a highly aggressive pressing game allied to a direct short passing game. This season Athletic have failed to match the level of intensity that is required to implement Bielsa’s plan sufficiently but recently there have been signs that they are delivering a higher level of performance. This began with an improvement away to Valencia when the side lost following the concession of two late goals. Against Madrid the passing was again better with 420 passes completed from an attempted 526. Athletic enjoyed more possession than their hosts too. Yet despite these positive aspects, many of the “normal” problems were evident again. A key component of Athletic’s game is to press the opponent high up the park and win possession back quickly. When successful with this approach, it can be very effective with Athletic regaining possession close to the opponents’ goal. When it fails, it can leave the team exposed as it often did on Saturday. If an opponent can avoid the first line of pressing from Athletic, there is ample space to exploit. The full backs are caught high and there is a gap in the centre of the pitch. Only five interceptions were made in the Madrid half of the pitch. Worse than that, only one tackle was made in the Madrid half. Athletic were successful with tackles and interceptions but they occurred far too deep and prevented Athletic from halting their opponent from playing and building up momentum of their own in the attacking third of the pitch. Time and time again, Athletic were forced to begin constructing attacking moves from their own half. 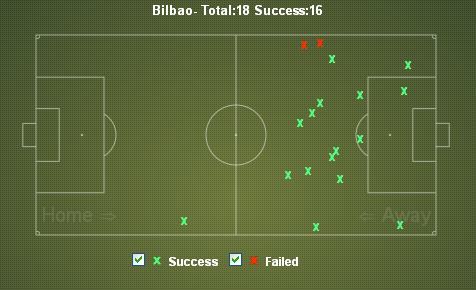 When they did move forward, Athletic were not afraid to commit men to attack but there was a lack of quality in the final third evidenced by having just one shot in target in the whole game which resulted in a goal for Ibai Gomez. Compare this to Madrid who had 17 attempts on target from an attempted 30. There was no midfield creator with Muniain failing to step into the void left by the absent Herrara. With Athletic not stopping Madrid high, Los Blancos evaded the first line of pressing from Athletic and enabled them to attack with fast transitions where Athletic are extremely vulnerable. Two of Madrid ’s goals came from such an approach with one scored by Karim Benzema and the French international providing an assist. 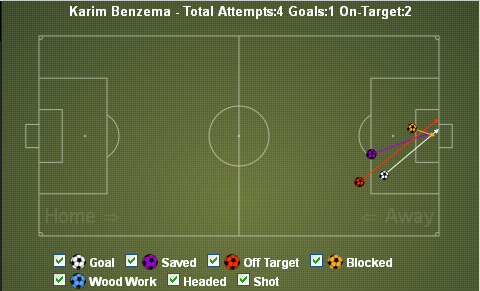 Benzema made five key passes but linked well in various parts of the pitch. As the central striker, he offered much more to his game than purely finishing within the penalty area. Beyond his contribution outside of the penalty area, inside of it Benzema was equally good with two of his four attempts at goal on target. Three of his attempts came from the right hand corner of the box including his goal. A possible reason for this is explored below. The first goal in the 11th minute was simple in its construction and perfectly executed by Benzema even if Aurtenexte had the final touch. A long ball from Modric exposed the high line from Athletic and Benzema pulled to the left of San Jose , finding space in the channel between the centre back and Aurtenexte at left back. He deftly lobbed the ball over Iraizoz for the opener. His second goal was a superb piece of skill. Receiving the ball with his back to goal in the channel between San Jose and Aurtenexte just inside the penalty area, Benzema shifted the ball with his right foot before swiveling and curling a shot beyond Iraizoz with his left. The Frenchman turned creator in the 55th minute to provide for Ozil following a brief period of Athletic pressure. Again, space was found to the left of San Jose and the ball was squared just inside the penalty area for the oncoming Ozil to finish. The goal was the ideal demonstration of Athletic being caught high upfield. Gurpegi should have been occupying the space that Ozil broke into but the veteran midfielder lacks the mobility and pace to perform the role fully and lagged behind Ozil as the transition took place. Arguably the perfect build up for Mourinho and his players. A comfortable win, no injuries reported, game time for all the key players and five goals shared amongst four players. For Athletic and Bielsa, it’s about taking the positives and addressing the negatives. Slowly, the team appears to be getting better but team selection is still blighted by injuries and suspensions. Add to that, Bielsa’s bizarre second half line up when he switched to a 4-1-4-1 with Aduriz appearing to be an attacking midfielder and the element of confusion persists. With no European football to distract them this season, Athletic must now begin the process of improving their league form and climbing the table.